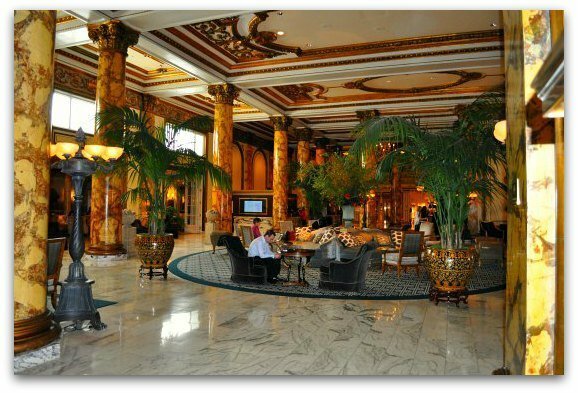 The Fairmont Hotel in San Francisco is part hotel and part museum. It's dripping with history. It has also hosted dozens of presidents and other dignitaries from around the world. If you are interested in staying a world-class hotel, this four star option is top on the list. It includes luxurious amenities, high-class customer service and a gorgeous decor. Even if you don't get the chance to stay here, I recommend stopping by to check it out. While you are here, you can also grab a bite to eat or a fun cocktail at one of its famous restaurants. Here is a sneak peek at its ornate lobby. It's tough to see all the detail in this picture, which is why you should stop by to see it for yourself. This hotel was first built in 1903. Shortly after it was completed, the city was rocked by the 1906 earthquake (learn more about this devastating quake). Although the interior was badly damaged, the building stood tall above the ruin around it. It reopened in 1907 and has undergone many changes since then. 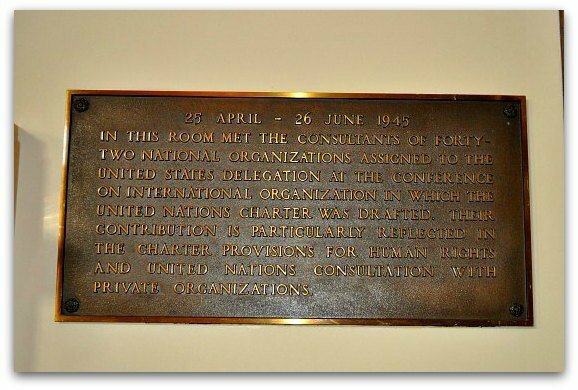 In 1945, the United Nations charter was drafted here. This is the reason why the flags are hanging above the entrance outside. You can learn a little more about it from this plaque that hangs on one of the walls in the lobby. 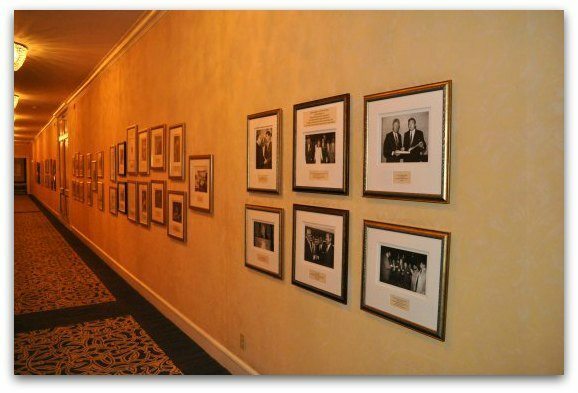 Since the UN charter was drafted, many US presidents have stayed here as well as other world leaders. 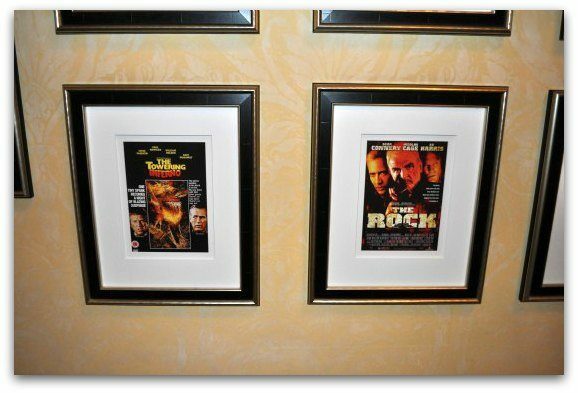 Several of their pictures are hanging on the wall in a hallway just to the left of the lobby. In addition to its famous guests, this location is featured in a number of films. Some of the most well-known include Vertigo, The Rock and The Towering Inferno. You can also learn more about these in the same hallway mentioned above. 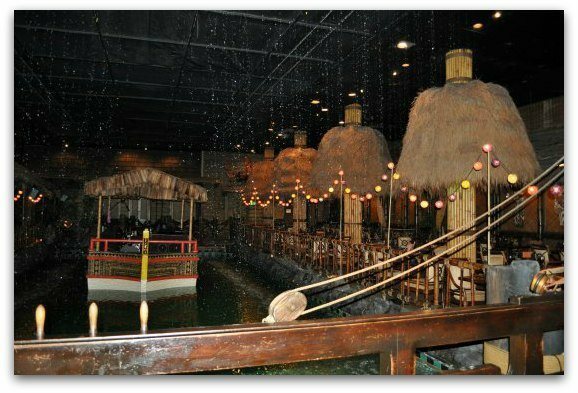 The highly talked about Tonga Room makes its home on the lower level of this hotel. This tiki bar and restaurant features Pacific Rim food, fruity drinks and live music. In the center of the bar, you will find the main attraction. Decades ago, the owner at the time transformed the indoor pool into an entertainment area. It includes a floating stage where bands perform. It also 'rains' in this area every 15 minutes, as you can see from the picture below. The Tonga Room Restaurant is open for dinner 5 days a week. They are open Wednesday, Thursday & Sunday from 6pm to 10pm. On Friday and Saturday, they stay open until 11pm. The Hurricane Bar inside the Tonga Room is also open just 5 days a week. On Wednesday, Thursday and Sunday, they are open from 5pm to 11:30pm. On Friday and Saturday nights, they stay open until 12:30am. You can also catch some great happy hour specials all five days from 5pm to 7pm. The Laurel Court is a higher end restaurant and lounge right behind the main lobby. It's open all day long and features everything from fresh salads to steaks. You can also head here for an afternoon cocktail or glass of wine. It's the perfect place to sit back and admire the beautiful decor. They open for breakfast at 6:30am on weekdays and 7am on weekends. They serve food throughout the day until around 10pm. The bar area opens at 11:30am and closes at around midnight. If you swing by for lunch or dinner (or have the pleasure of staying here), make sure you walk back to Cirque. This area only hosts private events, but was once a thriving bar and lounge area. 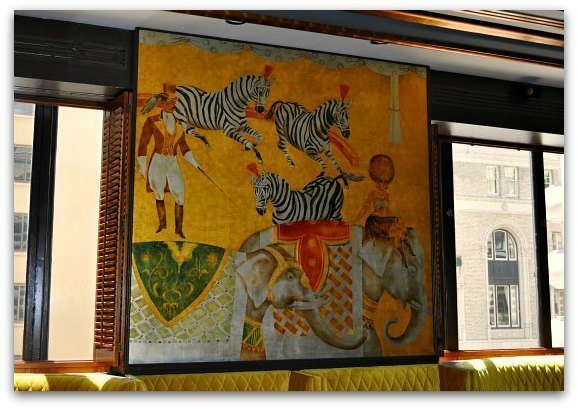 All along the walls, you will see some beautiful, unique animal paintings. These were added right before Prohibition (when this lounge originally opened). Even though it's no longer a public lounge, you can still see many of the paintings in the hall and from the doorway. Cirque is on the first floor of the hotel to the right of the main lobby. This hotel is in a fantastic location. It's away from the chaos of Union Square, but a short walk or cab ride away. 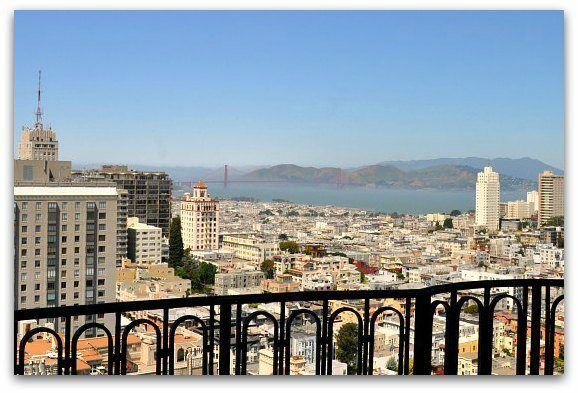 It's just steps from the famed cable cars, Grace Cathedral and other high-end hotels. You will find rooms that include historic touches, yet modern amenities. Each room offers comfortable mattresses, luxurious bedding and everything else you would expect from a four star hotel. Many rooms also offer a view of its colorful courtyard or surroundings. 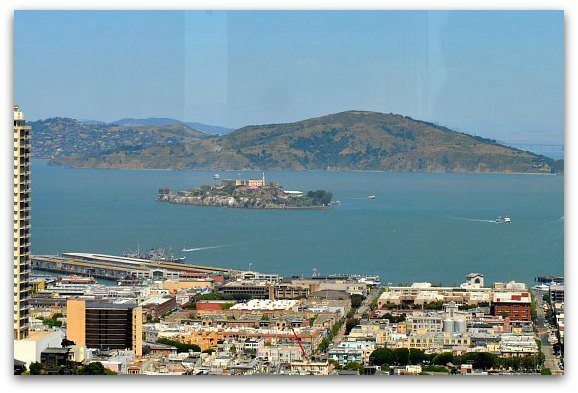 Some even offer premium views of the bay and downtown SF. From the front, this building looks like it's only a few stories tall. However, there is a 20-story tower behind it. This is where you can get some amazing views. These are just a few of the pics I took from their top floor Crown Room. This room used to be a bar and restaurant. Now, it's only used for special events. However, these pictures give you a good idea on the views from some of this hotel's top floors. Are you interested in booking a room? They offer a variety of room types. Room rates vary based on amenities and time of year, but range from around $200 to $1000+ a night. Check Booking.com to find the best selection and the amenities included with each room. From SFO: Your best bet from the San Francisco International Airport is to take a taxi or a shuttle. Both offer front door service. Taxi: A taxi from the airport will take about 30 to 35 minutes. The cost for this trip is around $55 including tip and the $2 airport service fee that will be added once you arrive. Learn more about taking a taxi to and from SFO. Shuttle: Using a shuttle will take a little longer. It's around $17 a person, but it might take you an hour to an hour and a half to get here. Many people use this option to get into the city, since it's more cost effective than a taxi (book your airport shuttle online). 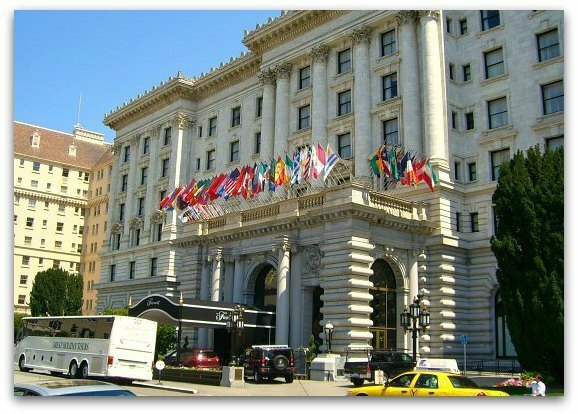 From Union Square: The Fairmont Hotel in San Francisco is just up the hill from Union Square. You can either walk up the hill (it's steep!) or take one of these transit options. California Cable Car: Walk over to California Street to grab this cable car line and ride up the hill. Once you get to the top (Mason and California), you will hop off. 1-California Bus: Walk over to Sacramento Street and hop on the 1 California bus. This bus will drop you off just a block away at Sacramento and Sproule Lane. From Fishermans Wharf: This is just a few blocks down the hill, so you can either walk up the hill (again, it's very steep!) or take one of these transit options. Cable Car: Take either the Powell/Hyde or the Powell/Mason cable car to the Washington and Mason stop. From here, you will walk straight up Mason Street. It's about two blocks away from this stop, but the closest option. Both blocks are very, very steep, so take your time on the way up (and don't forget to turn around for some of the best views of the bay!). Taxi: If you don't want to walk up the steep hill, you can also take a taxi from Fishermans Wharf. This will only cost about $10 as it isn't very far away. You could always take the taxi up and then head down the hill to grab the cable car for the ride home.